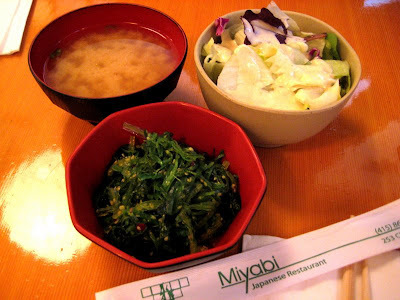 For J’s belated bday dinner, he picked Miyabi in the Mission. I’m staying in the Mission, and this is why most of the food choices will tend to be centered in this fine SF neighborhood. It’s easy to eat around there, there’s tons of choices. Whether it’s on Mission, Valencia, Church, or Castro streets, restaurants abound. People love to eat here. And drink here. And so it begins! This is a nice little low-key spot. Miso, side salad, and seaweed salad. All good. I love me some seaweed salad. Explain it to me, why is this so good? Can one make this at home? 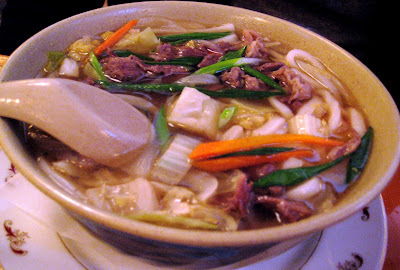 J got the udon with beef. While the soup and the noodles and veggies were good, he was quite annoyed with the meat. I told him to get the shrimp tempura! But no, he insisted on meat. And then he got stuck with fatty chewy cheap slices of meat. Why does noone listen to me? But other than the meat part, he enjoyed it. I got a godzilla roll, the one on the bottom. Holy heck. They have pictures of their rolls, and in the photo, this roll was not this ginormous. And then it showed up on the plate, with a diameter of about 3 inches. Normal people can’t fit this in their mouth. I don’t have a flip top head! I don’t remember what was in it, but it was various stuff. And it was battered and fried. Hee! And then a squirt of spicy sriracha-ness on top. Tasty. The roll on the top was some kind of spicy tuna roll with crunchies on it. Also quite tasty. This was way too much roll for me, and for both of us, so half of this came home. They made excellent snacks later in the evening. Miyabi was quite busy. Most people seemed to have gotten some type of bento box type combo. Their prices were quite reasonable for these, so I can see why. Service was just fine. 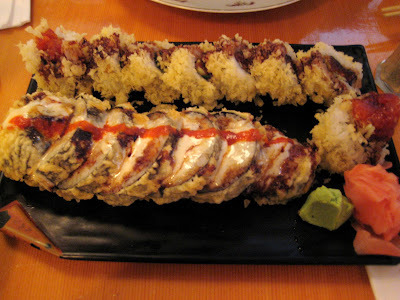 It’s nothing extraordinary, but quite decent and very affordable for japanese/sushi.